Best way to restore .vpf settings files AND set up Image Pro Plus for mutiple users? Apologies I posted this under Automation and Macros before/just now (it's Monday what can I say). 1. I'm trying to restore corrupted .vpf files (possibly overwritten by another user or corrupted during a crash). Is the easiest way to just to drag an drop previously saved .vpf backup files to the Documents & Settings folder? 2. Is it possible to have Image Pro Plus set up so 2 separate users can have their own capture/work environment? In order that their different capture settings (.vpf files) are kept separate and don't get corrupted/overwritten. Can IPP be set up to have 2 totally distinct user profiles/logins which don't interfere with each other? For instance could this be done with separate Windows Logins and saving .vpf files to different Document and Settings folders? Yes, restoring the vpf files can be done by copying the backups to the Documents and Settings folder under IPWIN70. 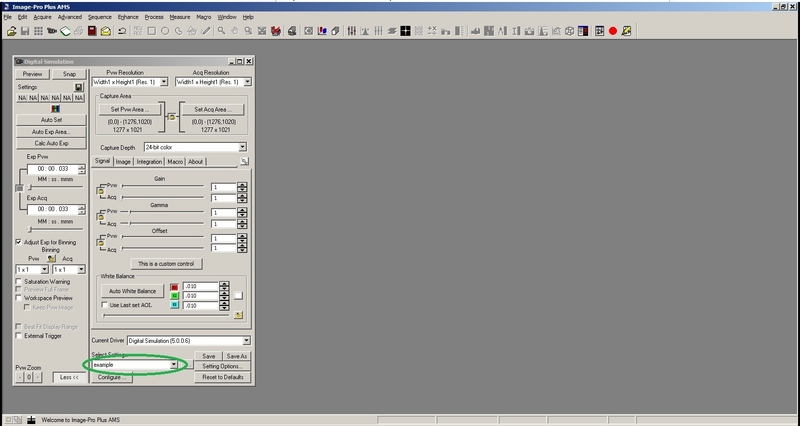 There is no support in Image-Pro Plus for different user profiles. 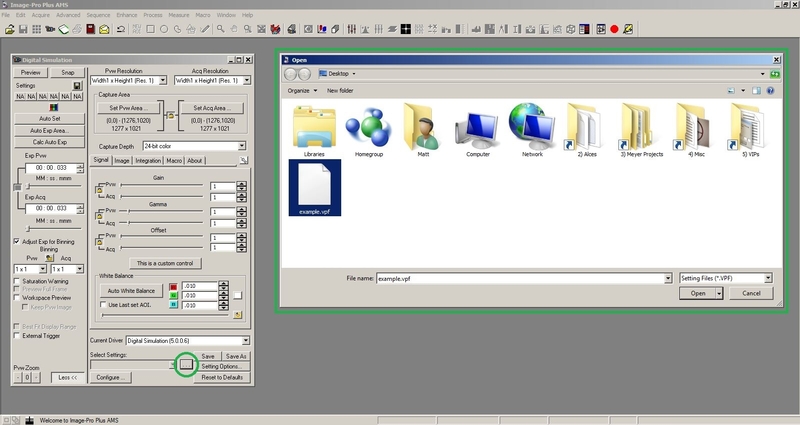 Our latest product, Image-Pro Premier 9.2 does have support in the application for different user profiles and logins. Please be aware that VPF FILES do not have to reside in the DOCUMENTS AND SETTINGS FOLDER under IPWIN70. There is an ADVANTAGE to them residing there (they "automatically" appear on the SELECT SETTINGS DROP DOWN MENU in CAPUTURE) but they can be SAVED IN and OPENED FROM any FOLDER. 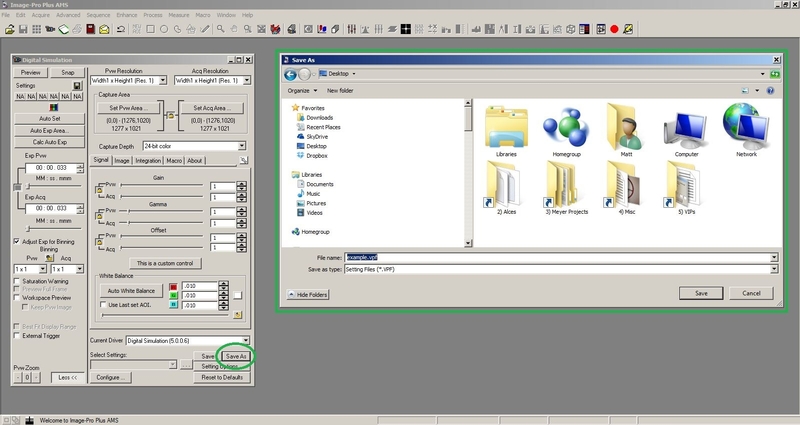 After you perform an OPEN (using the "..." button) the SELECT SETTINGS DROP DOWN MENU will be populated with the VPF FILES found in the FOLDER used in the OPEN. Please see the attached JPG IMAGE FILES. Thanks Trey and Matt. You both confirmed my initial thoughts. I didn't want to spend time trying solutions only to discover I'd wasted my time. It's been really helpful, cheers.